Note: This article is part of a series of 2018 ballot issue analyses written for the Blue Line by author Richard Valenty. You can find coverage of the other 2018 ballot issues here. Ed. Overcrowding at the Boulder County Jail has long been an issue, and anyone who really wants to get into the weeds can read a 2016 study called “Jail Overcrowding in Boulder County” to learn more. In short, Issue 1A would fund construction of a new alternative sentencing facility near the jail to help ease the overcrowding, and would fund expansion of alternative sentencing programs. If voters approve Issue IA, a 0.185% countywide sales and use tax that currently funds flood recovery efforts would be extended from its current Dec. 31, 2019 sunset date. 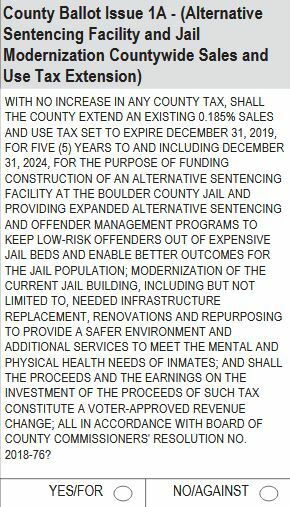 The revenue would then be used for the alternative sentencing facility and programs until Dec. 31, 2024—a five-year extension of the 0.185% tax. The Boulder County resolution for 1A estimates it would generate about $10 million in annual revenue over five years. New 46,000 square foot, 250 bed Alternative Sentencing Facility (for work release, day reporting, home detention, community corrections):​​ $21.6 million. New intake building (booking room, intake holding cells and waiting area, screening rooms, office space):​ $8.5 million. Administrative building addition (office space, training room, employee break room, locker rooms): $7 million. Remodel old administrative building (larger courtroom, inmate visitation, office space for medical and mental health staff):​ $5 million. Remodel existing Building C (convert to “transitions” classification for inmates preparing to re-enter the community): ​$6 million. According to the 2016 study, there is no single reason for current jail overcrowding, but it suggested a few contributing factors, including: a) increases in the number of women and people with special needs; b) backlogs in the work release program resulting in lower-risk individuals taking up high-risk beds; and c) increased lengths of stay for populations such as the mentally ill, substance users, and the chronically homeless. So, could jail overcrowding be mitigated with alternative sentencing facilities and programs? The 2016 study notes that the jail population at that time included “offenders who aren’t high risk, weren’t convicted of a person crime, and/or committed misdemeanors or municipal-level offenses,” and recommended forming an alternative sentencing department, among other measures. If 1A is defeated, the 0.185% tax for flood recovery would continue until it sunsets on Dec. 31, 2019. Alternatives to incarceration can be cost-efficient, since keeping people in jail is expensive. The current county jail is often occupied at or near capacity, so the facility that 1A would fund would give staff more space in which to perform its complete range of duties. Jail may not be the best place for people who are not deemed dangerous criminals, and alternatives to jail can be beneficial to those individuals. 1A would extend an existing tax, so passing it would not increase local tax rates. Extending a tax that would otherwise sunset could be considered equivalent to a tax increase. Using the 0.185% tax for this purpose is very different than the original purpose (flood recovery) of the 2014-19 tax.